It is with great pleasure that we are publishing this translation of a commentary on last week’s election in Catalonia, from the Spanish blog, Nuevo Curso. We have already published their earlier comments (see leftcom.org) with which we remain in substantial agreement. The result of the election was indecisive. It gave the pro-Independence parties 47% of the vote and a majority of 5 seats over the combined pro-Spanish parties. Amongst the latter the Ciudadanos (Citizens) party has become the first non-separatist party to have the largest number of seats in the assembly. The Popular Party of Spanish Prime Minster Mariano Rajoy (which is tainted by its origins in Francoism and by its refusal to either compromise or handle the situation with competence) was all but wiped out with only 4 % of the vote (and 2 seats). With neither side prepared to back down the crisis will run and run. The key strengths of the article are three. First, and most significantly, Nuevo Curso are agitating for workers not to get dragged into this clash of capitalists. Workers have nothing to gain from agreeing which language they are going to be exploited in. Marx’s observation in the Communist Manifesto that “workers have no country” is as true now as it was 170 years ago. And to follow the flag of this or that national ruling class is put ourselves at their disposal, both by accepting exploitation, and supporting their wars across the planet. Second Nuevo Curso underlines the fact that this crisis has arisen at a time of capitalist economic crisis from which our rulers have no solution other than to pile sovereign debt on top of private debt. In this situation the kakistocrats who rule the world are translating their economic impotence in political incompetence by clutching at straws, from Brexit to a narrow economic nationalism and trade wars. In this increasingly reactionary scenario nationalism and racism are being whipped everywhere (including Catalonia where non-Catalans are referred to as Xarnegos or charnegos – a racist term which is equivalent to “mongrel”). The class base of such racism is as always found in the petty bourgeoisie who everywhere see the “outsider” as the enemy. And this brings us to the third point of the article which is the class nature of Catalan nationalism. It is not supported by the big bourgeoisie which is absolutely linked to Spain and its place in the European Union. 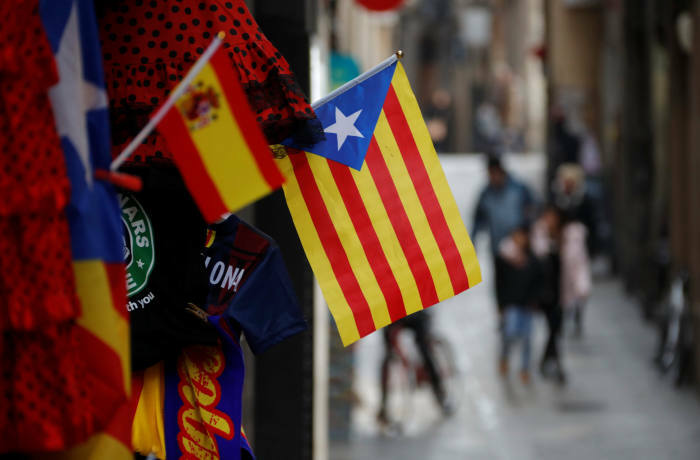 Since the crisis launched by the separatists with the beginning of their “independence process” 3000 companies, large and small, including Catalonia’s two largest banks, have moved their headquarters out of the region. The formation of new businesses has slumped to the lowest since 2011 when the effects of the financial crisis were fully felt. Puigdemont, and his fellow nationalists, are not unaware of this but are resorting to fantasy. Puigdemont asserted on a video link from Brussels that big business might desert the region but “Our small and medium-sized enterprises are those that don’t change their headquarters…”. In fact the deserters include hundreds of smaller companies as he well knows. [See elpais.com]. Thus the election result, which has largely reproduced the status quo ante, has resolved nothing. Hence why the Spanish comrades refer to events in Catalonia as “groundhog day”. How do we escape the “Groundhog Day” of the Catalan Elections? No parliamentary party is going to defend us from being crushed by exploitation, from ever more precarious jobs or from social exclusion. It is not a matter of language or country, it is a matter of class. To leave the “groundhog day” in which the Spanish bourgeoisie and the Catalan pro-independence petty bourgeoisie live, we have to abandon any idea of the nation, the "people" and "citizenship". 1) Catalan elections were held yesterday. The participation rate was unusually high. The independence movement gave its all and won 50,000 more votes. The "Unionists" threw themselves into an open grave to mobilise working-class neighbourhoods and managed to drag thousands of normally abstaining workers to the polls. The final balance has been a blow to the Spanish bourgeoisie. Puigdemont, has happily declared from Brussels: “the Spanish state has been defeated”. And it is true: overturning the result using the preventive detention of elected pro-independence candidates would only serve to undermine the legitimacy of the Spanish state still further. Using Article 155 [which suspended the regional government and led to this election – translator] again in three months, as suggested by the Popular Party candidate, Albiol, would be even worse. But the pro-independence petty bourgeoisie does not have the capacity to go beyond its fake independence. To say that its victory will serve "to make the republic a little more real", as Rovira, the ERC [Catalan Republican Left] candidate, has done, makes it clear. What his statements demonstrate, alongside those of Albiol and Puigdemont, is the impotence of both parties in either imposing their solution or winning each other over. Neither the Spanish bourgeoisie nor the Catalan petty bourgeoisie know how to get out of the "groundhog day" which they have got themselves into. 2) What we are seeing in Catalonia is no different to what happens in many other places, inside and outside of Spain. After ten years of crisis, the bourgeoisie does not know how to satisfy or contain the petty bourgeoisie. This class, which is normally its panegyrist and its ally, is today a force without a compass, reactionary and utopian at the same time, pure poison for the workers and a new centrifugal force for the national bourgeoisie and the state. Everywhere the bourgeoisie has less and less capacity to contain an increasingly reactionary and utopian petty bourgeoisie, venomous for workers and a danger to the state. 3) In the current phase of the class movement, workers do not yet exist as an independent political subject. The whole "process" [towards independence] has attempted, at one time or another, to take advantage of that absence, and tried to drag us behind one banner or another. So far without great success. This failure of both parties to impose their patriotic framework has been very important. The only options that the independence movement had in escalating the conflict was to show its ability to set the agenda, and to get an imperialism opposed to the Franco-German axis (Great Britain? USA? ), to commit to its cause, thus forcing the Spanish state to accept defeat or start a war. Their model at this point, as they have already said many times, was the Slovenian or the Croatian one. That is, having accepted the framework of one side or the other, we would probably have been led to sacrifice ourselves on the altars of both countries. 4) The mobilisation and pressure to get workers to vote in these elections has been the only notable success of the Spanish bourgeoisie. To achieve this, their political representatives had to break an old taboo that was part of the "Catalan consensus", that is to say of the "social contract" between the Spanish bourgeoisie and the Catalan petty bourgeoisie: to denounce the cultural and linguistic oppression suffered by the vast majority of workers [who don’t speak Catalan – translator]. It was a risky bet: the coincidence between class and language is too close for it not to be. At the same time the independence movement has not been able to set the agenda as the strike of October 3 seemed to promise it would. The vote by definition demands so little commitment that it is secret and, on the other hand, we have not seen great expressions of real enthusiasm in the streets. There is no doubt that many workers voted for Ciutadens [Catalan version of the pro-business party, Ciudadanos – translator] yesterday as a way to show their distaste for the Catalan petty bourgeoisie supporters of independence denial of the existence of the Spanish-speaking workers – who are the great majority in areas of high industrial concentration – a denial that the recent struggle for independence has exacerbated. But in that rabid denial, linguistic and cultural aspects are only the tip of the iceberg. "National" or linguistic division, "identities" and the "sense of belonging" are just attempts to of exclude us and divide us by generating a stupid sense of superiority in that increasingly desperate petty bourgeoisie. At bottom, their continual attack is no different from anything that Ciutadens and all the other parties advocate in their economic programmes and carry out where they are in government. It's not a question of language or nation, it's a class issue. Many workers in Catalonia may realise that now. But things are not going to be easy. The bourgeoisie in all its national forms and flavours wants us to feel defeated, and they will bombard us with defeatism in the coming days, weeks and months. Only one thing could make a difference. The emergence, not only in Catalonia, but throughout Spain, of independent struggles that, however localised or "small" they may seem, make it possible for the class to fight under its own banner, and nourish a conversation beyond the bounds of the nation, the "people" and being "citizens". Nuevo Curso 22 December 2017.